After my trip to New York City last fall, I've been on a serious bagel & lox (or, more accurately, smoked salmon usually) kick. Lox is thinly sliced salmon belly that has been salt-cured or brined, while smoked salmon is a more general term and can be made from any part of the salmon. Bagel & lox is generally the go-to term for a bagel with cream cheese, lox, capers and red onions -- even though smoked salmon is often used. Morgantown has just a handful of establishments that offer a bagel & lox - most often at brunch - so I decided I need to try all of them to find my favorite. 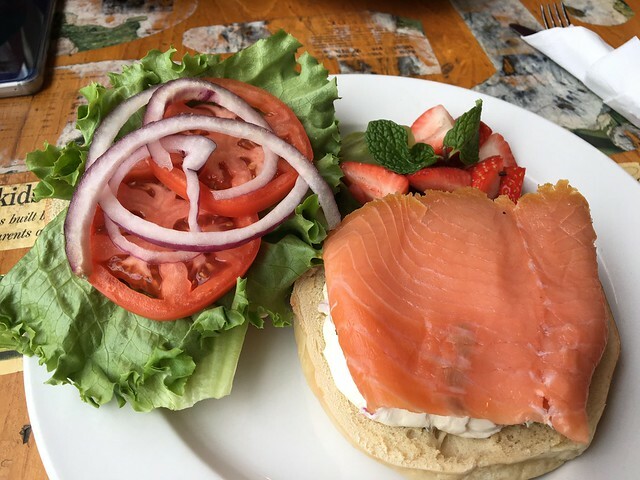 Blue Moose Cafe has the closest to original lox bagel: smoked salmon, caper cream cheese, lettuce, tomato and red onion, plus a small side of fresh fruit. I'm a big fan of Blue Moose's cream cheeses (mm scallion cream cheese), so the caper cream cheese is perfect for this meal. Tomato is a common addition to this sandwich. The bagel was nicely toasted, and I was happy to have enough onion to get pieces in each bite. Terra Cafe also has a very good bagel & lox. 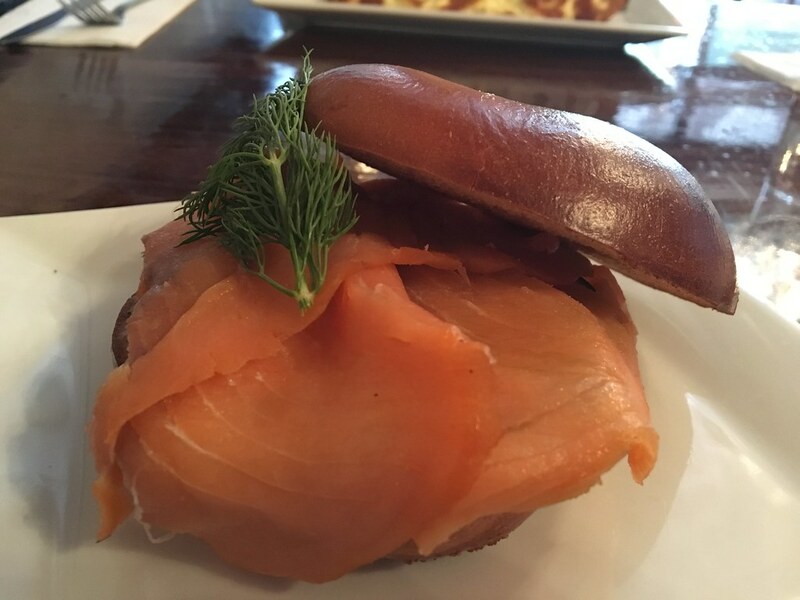 They have your smoked salmon on a darkly toasted, made-from-scratch bagel, topped with cream cheese, smoked salmon, capers and pickled red onions. They also serve a side of fresh fruit - pineapple, melon, blueberries. If you like your bagel & lox on the crispier side, definitely check out Terra. I like picked onions, but the raw onions add a crunch. But, since the bagel is crispier, it remedies itself. Tin 202 puts a different spin on the lox bagel by adding mascarpone cheese, cucumbers and capers. 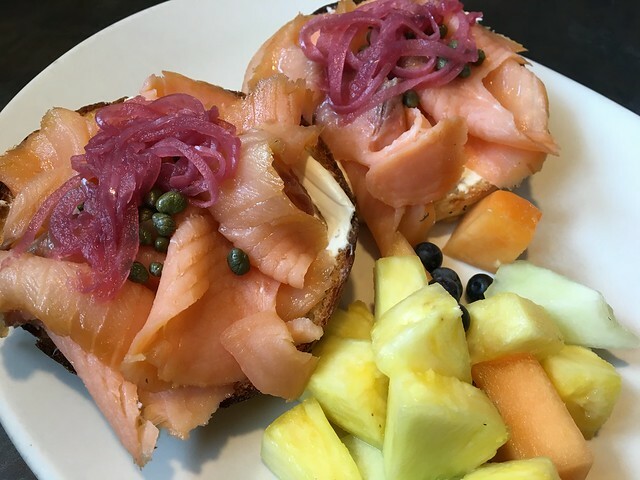 Think of it as a bagel & lox kicked up a few notches. The cucumbers keep it a bit lighter tasting, and the mascarpone still gives that creaminess you want from this sandwich. 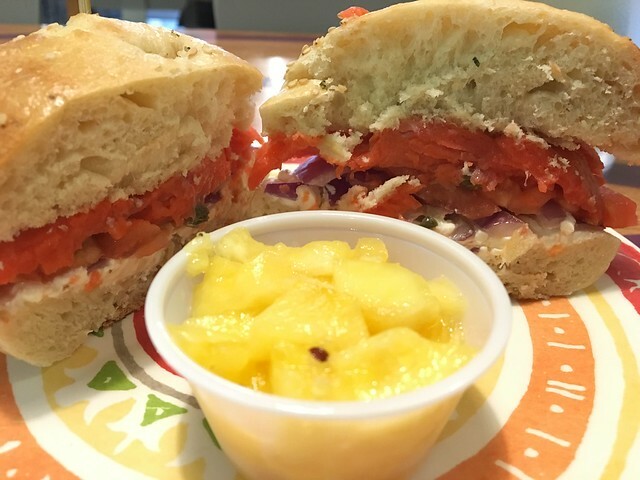 Real Juice Bar & Cafe features a wild, Alaskan, cold-smoked salmon with cream cheese, onion, tomato, & capers on a bagel. This bagel was very bready, making this more like a real sandwich. 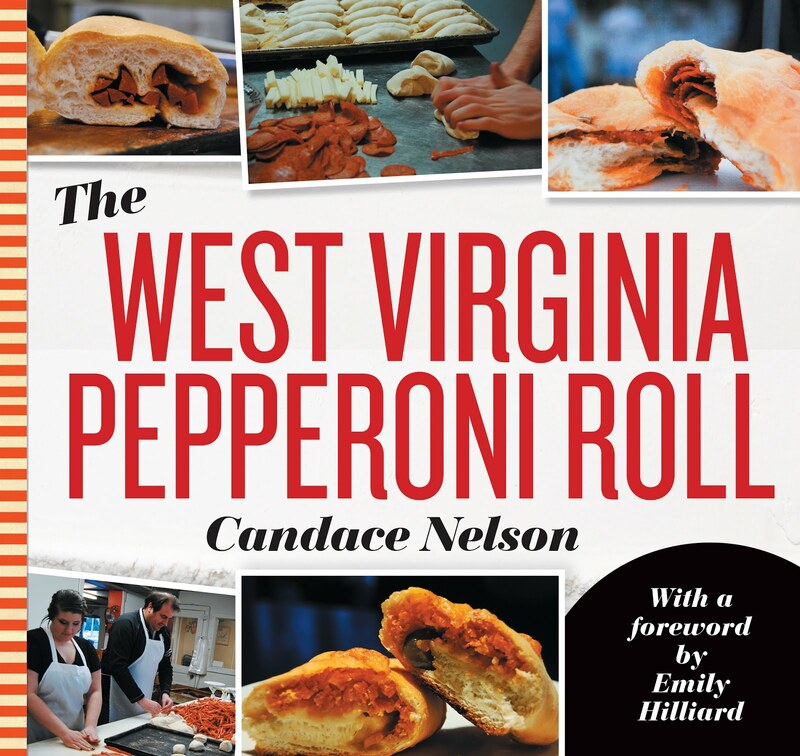 The salmon here is a bit thicker, so if that's your thing, you'd be all about this one. A tasty cup of pineapple on the side gave some nice acid to the meal. Have you had any? Or all? What's your fav!